Such a cute little mod set from Mary Maxim! Mary Maxim Mellowspun, Jacket: 9(9:10:10:11) skeins Main color (M), 2(2:2:2:2) skeins Contrast (C), Beret: 2 skeins M.
Crochet hook each size 9(I) and 8(H). Jacket: To fit bust sizes 34″(36″:38″:40″:42″). Finished measurement 36″(38″:40″:42″:44″). Length to shoulder 22″(22+”:221″:24″:23″). Sleeve seam 17″. Beret: To fit average head size. Tension: 7 sts and 8 rows =2″ square measured over sc on size 9 hook using double yarn. Special Abbreviations for Beret Inc 1= increase 1 st by working 2 sc into next sc. Dec 1 =pull up 1 loop in each of next 2 sc, yo and through the 3 loops on hook. Note: Yarn is used double throughout. Wind 2 balls together to avoid tangling. Back: Using size 8 hook and M yarn wound double, make 64(68:72:74:78) ch, work 1 sc into the 2nd ch from hook, 1 sc into each ch to end. 63(67:71:73:77) sc. * Next row: 1 ch, 1 sc into each st to end. Rep the last row 6 times more. Change to size 9 hook and work 7 rows in C, 7 rows in M and 7 rows in C. Break C * and continue in M only until back measures 15″. Shape Armholes: 1st row: SI st across first 2 sc, 1 ch, 1 sc into next sc, 1 sc into each st to last 2 sc, turn, (2 sc decreased at both ends of row). Rep the last row 1(1:2:2:2) times more. Next row: 1 ch, 1 sc into each st to last st, turn, (1 sc decreased at end of row). Rep the last row 5(7:5:5:7) times more. Work straight on remaining 49(51:53:55: 57) sts until armholes measure 7″(7+”:7+”: Shape Shoulders and Back Neck Next row: Work to last 7(7:8:8:9) sts, turn. Next row: Work 7 sts, break yarn and fasten off. Leave 21(23:23:25:25) sts at centre and rejoin yarn to remaining 14(14:15:15:16) sts. Work 7 sts, break yarn and fasten off. Left Front: Using size 8 hook and M yarn wound double, make 31(33:35:36:38) ch, work I sc into the 2nd ch from hook, 1 sc into each ch to end. 30(32:34:35:37) sc. Work as given for Back from * to *. Work straight until front measures 9″. **- Shape Neck Leave 1 st unworked at end of next row (front edge). *** Dec 1 st at front edge of every following 4th row 4 times more. 25(27:29:30:32) sts remain. Dec 1 st at front edge of every following 6th row, and at the same time when front measures same as back to armholes shape armhole as fol-lows:— dec 2 sts at armhole edge of next 2 (2:3:3:3) rows. Keeping neck decs correct dec 1 st at armhole edge of alt rows 3(4:3:3: 4) times, then continue neck decs only until 14(14:15:15:16) sts remain. Work straight until armhole measures same as back arm-holes ending at front edge. Shape Shoulder Work 7 sts, break yarn and fasten off. Right Front: Work as given for Left Front to **. Shape Neck: Next row: SI st across 1 st, 1 ch, I sc into next st, 1 sc into each st to end. (I st decreased at front edge.) Complete as given for Left Front from *** to end. Sleeves Using size 8 hook and M wound double, make 31(33:35:37:39) ch, work I sc into the 2nd ch from hook, I sc into each ch to end. 30(32:34:36:38) sc. Work as given for Back from * to * at the same time increasing 1 st at both ends of the 5th row and then every following 9th row. Continue in-creases as before until there are 44(46:48: 50:52) sts. Work straight until sleeve mea-sures 17″, or required seam length. Shape Top Dec 2 sts at both ends of next 2 rows. Dec 1 st at end of next 8 rows. Dec 1 st at both ends of next 6 rows, break yarn and fasten off. Finishing and Front Band: Press pieces according to instructions on page 36. Join shoulder, side and sleeve seams. Insert sleeves. Front Band: Using size 8 hook and M wound double, and with right side of work facing work 1 row sc up right front edge, round neck and down left front edge work-ing about 7 sc to every 8 rows. Turn and work 3 more rows. Mark positions on Left Front for 5 buttons the first=” above lower edge and the 5th +” below beg of neck shaping. Space remainder evenly between. Work 1 more row sc but making button loops on Right Front by working 3 ch in place of 2 sc to correspond with each marker. Press seams and band. Sew on buttons. Change to size 8 hook and work 5 rounds. Fasten off. 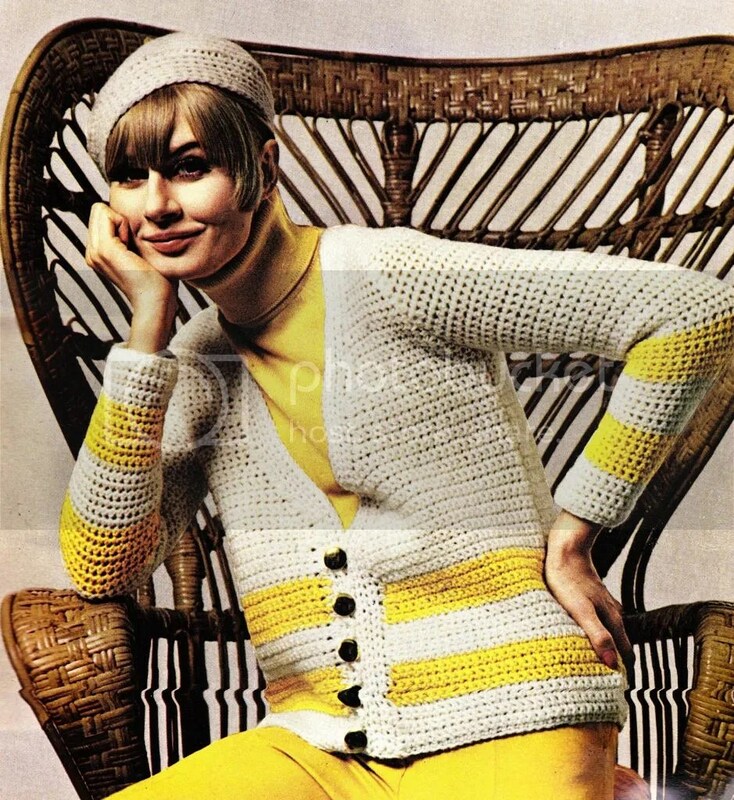 This entry was posted in crochet pattern and tagged 1960s, sweater. Bookmark the permalink.